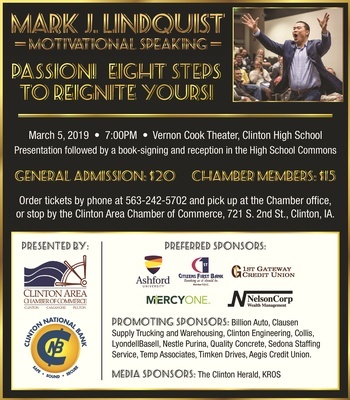 The Clinton Area Chamber of Commerce is pleased to announce that Mark J. Lindquist will be visiting Clinton to present: Passion! 8 Steps to Reignite Yours. Mark J. Lindquist has appeared in ABC's LOST, CBS' Hawaii Five-O and the Universal Studios movie "Battleship." He is a world-touring entertainer who has performed live for over 3 million people in 22 countries and 44 states throughout his career. 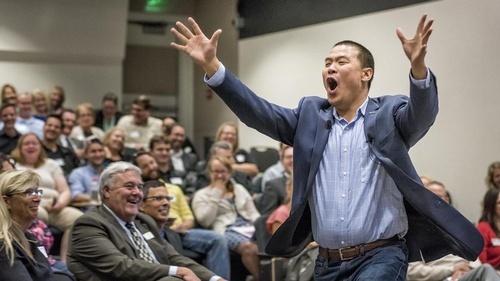 As a highly sought-after National Anthem singer, he performs for the largest crowds in America for teams such as the Minnesota Vikings, the Los Angeles Dodgers, Duke University Men's Basketball, the College World Series, the NCAA and in venues such as Madison Square Garden. This event is co-sponsored by: Clinton National Bank, Ashford University, Citizen’s First Bank, 1st Gateway Credit Union, MercyOne, NelsonCorp Wealth Management, Billion Auto, Clausen Trucking and Warehousing, Clinton Engineering, Collis, LyondellBasell, Nestle Purina, Quality Concrete, Sedona Staffing Service, Timken Drives and Aegis Credit Union. Media Sponsors are The Clinton Herald and KROS Radio. The presentation will be followed by a reception and book signing in the CHS Commons. General admission tickets are available for purchase for $20 through the Clinton Area Chamber of Commerce. Tickets for Chamber member businesses and their employees are $15. To purchase tickets, visit the Chamber at 721 S 2nd Street or call 563-242-5702 to make your reservation. Please email chamber@clintonia.com for more information.